Opening Thursday March 9 at FiveMyles, 6 pm to 9 pm. On view through April 16. Walking through the streets of Brooklyn, you can see a lot of discarded materials on the sidewalks. Maybe a television set, a hunk of plastic, or a mattress of questionable quality. Sometimes, these tossed-away items have been adorned with a face or a boldly-outlined design that makes you look twice. This is the handiwork of Sara Erenthal, a multidisciplinary artist who has shown an affinity for scrawling on sidewalk-bound paraphernalia. 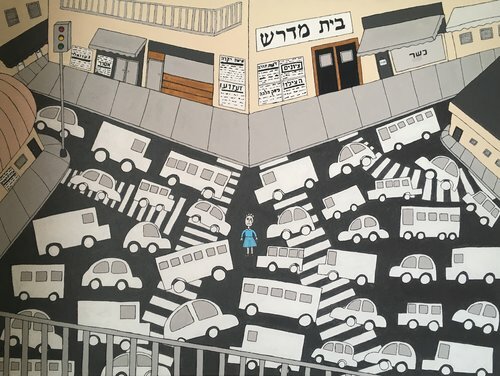 This show is not out in the streets but at a gallery, and she’s less interested in catching the interest of pedestrians and more interested in harnessing acrylic paint on canvas to depict moments in her life that have left an impact on her. Erenthal hasn’t lived a particularly ordinary life. She was born into an ultra-Orthodox Jewish family and left at 17 in order to escape an arranged marriage. Now, she travels and creates art, whether it be painting, sculpture, video, or even performance. I first got to know Sara through a series of street performances I participated in alongside Matthew Silver and his cohorts, and have seen her gain traction in the art landscape since then. 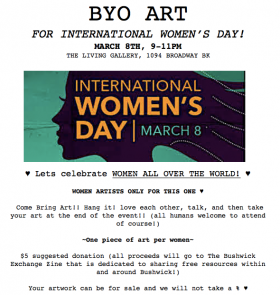 There will be a panel discussion with Erenthal, Lois Stavsky of Street Art NYC, and a representative from the gallery on Sunday, March 19 for those who would like to learn more. 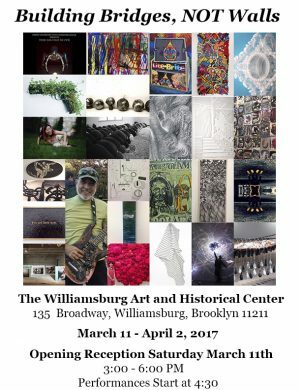 Opening Saturday March 11 at Williamsburg Art and Historical Center, 3 pm to 6 pm. On view through April 2. The Williamsburg Art and Historical Center will be the home for this exhibition curated by mixed media artist norton, featuring the work of 26 different artists who are “demonstrating their belief in a peaceful global community that transcends borders, religions, sexual identity, race, or gender.” It is only logical that such a large number of artists are taking part in an exhibition that seeks to tackle such a lofty and multifaceted theme with seemingly no clear solution. Peace, especially now, can seem like a highly utopian concept. But taking in the many ways a diverse group of artists approach the idea could be insightful or even inspiring. The opening on Saturday afternoon will feature several performances, with music performer Pablo Alvarez, performance group Dirty Churches in conjunction with Alexandra Jacob, and Butoh performer Mariko Endo.